I can’t believe it is that time of the year already! Where did the summer go?? That being said- I am super excited to start the new school year and to meet my new kiddos! I feel like a kid again. I have been working really hard over the summer to get ready for that big day. I just want to get back into my classroom to start preparing! Is that too much to ask?! One of the things that is going to majorly help me this year is the Daily Morning Work Bundle for Second Grade. 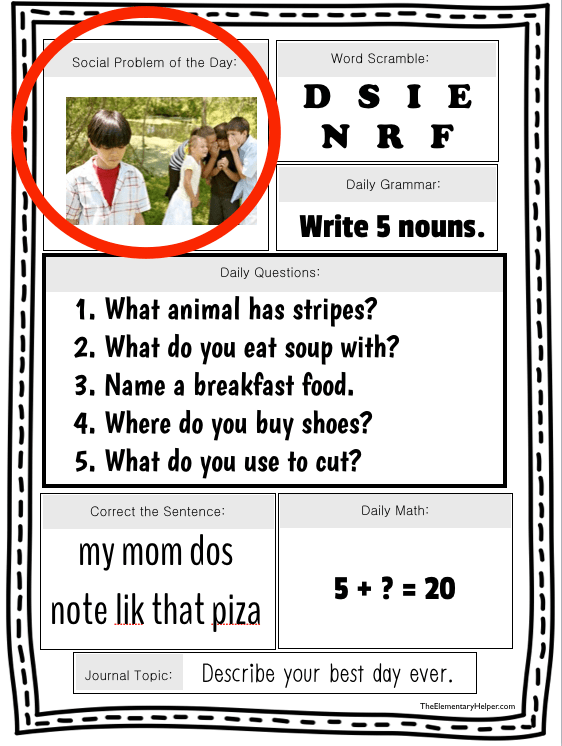 This is an AMAZING resource, that is easy to use and aligned with the Common Core (hello easy lesson planning!). There is a new page for each day of the year to help build routine and structure. All you have to do is make one copy of each daily page and place them in a binder to display for the students. I keeping mine in a 3-ring binder with a post-it (or something similar) to hold the current page. I plan on displaying the daily morning work using my document camera and projector for the whole class to work on when they come in in the morning. I want my students to be able to take responsibility for the routines in the classroom so I plan on having one of my student jobs being to get the Daily Morning Work ready the DAY BEFORE, so we are all set to go the next morning. The resource also comes with two student pages so the students have somewhere to share their thinking. To help save paper, just print the pages back-to-back. I plan on (when I’m able to get back to school) on printing the student pages out and binding them to make notebooks. (Pictures to come.) This way the work can be all in one place and I don’t have to run and make extra copies of the student sheets. There are seven different categories that help build student social skills, language arts skills, and math skills. 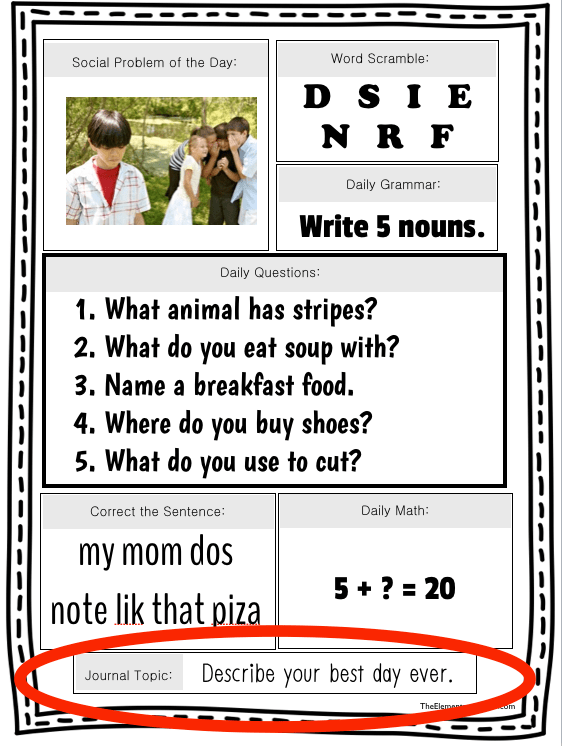 Each category has a different topic or skill each day. This is a great way to build social skills with our students. We tend to get so focused on our lesson plans that sometimes we forget to teach our student “how” to behave and react to each other. I plan on continuing the Social Problem of the Day in my morning meeting to help facilitate student discussions on their reactions to behaviors in social situations. This is a great opportunity for students to challenge themselves, not only during morning meeting, but also throughout the day. a little healthy competition never hurt anyone. 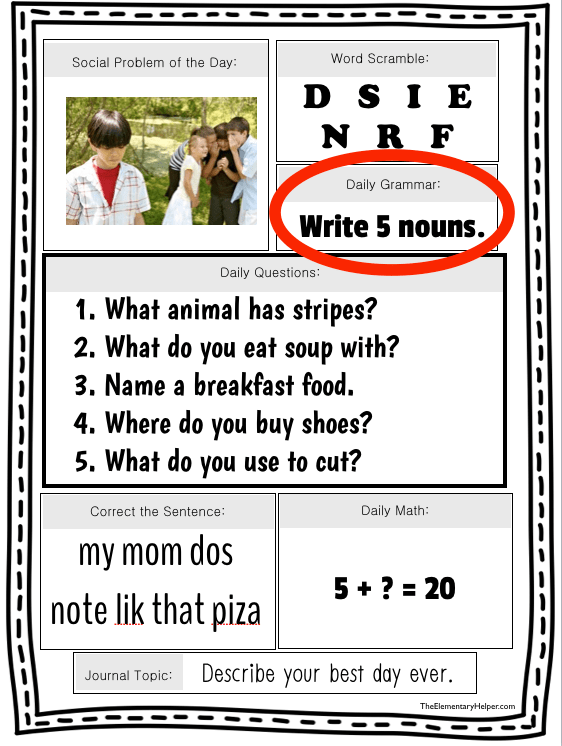 This was designed to keep the grammar in the students minds, and not just during “grammar time.” If you are working on a grammar skill that week and feel that your students need a little more practice, feel free to swap in what skill you need. Remember, it is all about helping our students grow. 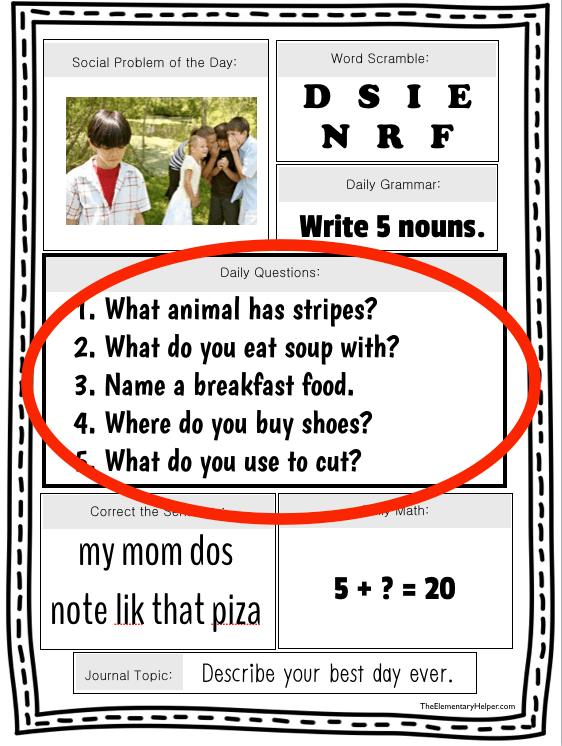 These daily questions are great conversation starters and thinking stems. 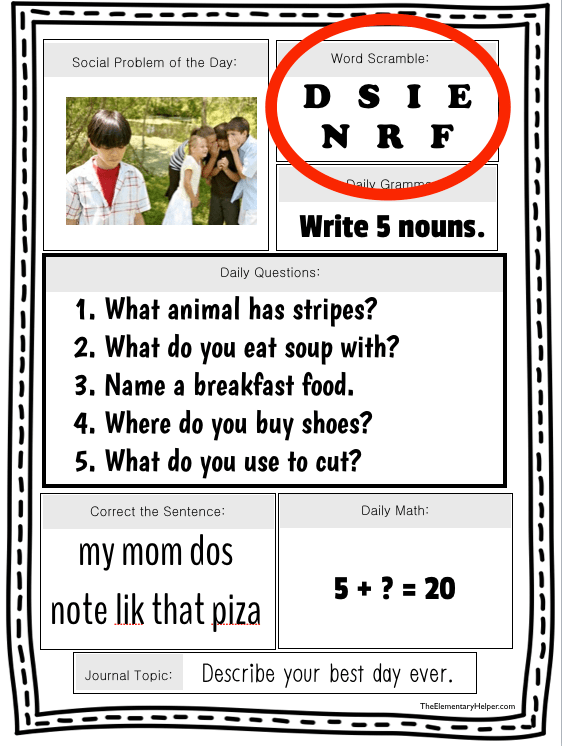 The questions help the students get into the mind set of answering questions through writing. I also plan on using these questions in my morning meeting and throughout the day. 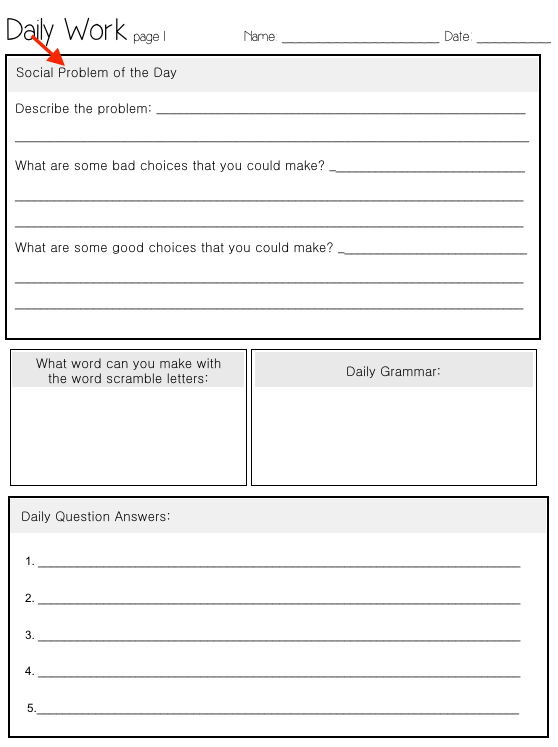 I might pick 1-3 questions to use throughout the day for them to stop and practice out Turn & Talk (blog to come). I like to use this strategy when we are in the “in between” moments. Such as at group bathroom breaks, waiting for the specials teachers, or really anytime we have that free minute or two. An extra opportunity to build in that grammar component! 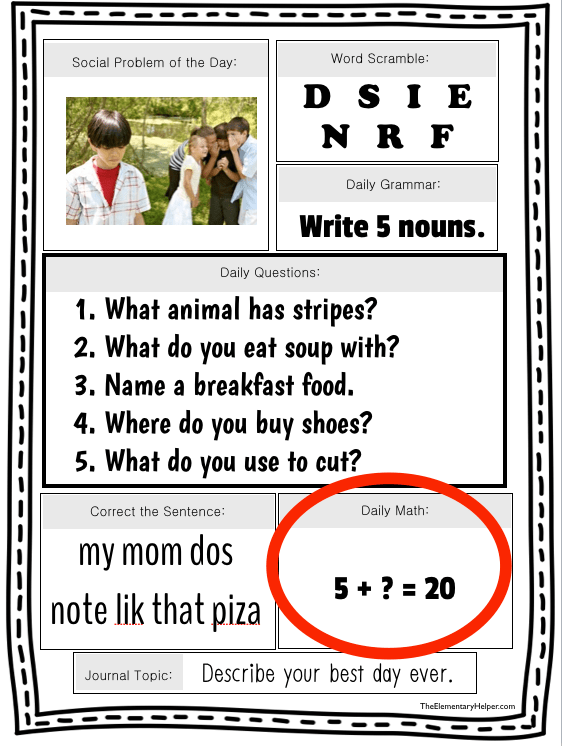 The Daily math changes daily as a means to practice different skills and strategies. The daily math includes strategies such as addition, subtraction, counting money, telling time, and much more! This is a great way for student to practice different types of writing. The prompts include narrative, opinion, and informational topics. These journal topics are also great to be used through out the day as ways to help build socializing skills for our students. Students love to talk about themselves, and we love to listen to what we they to say. 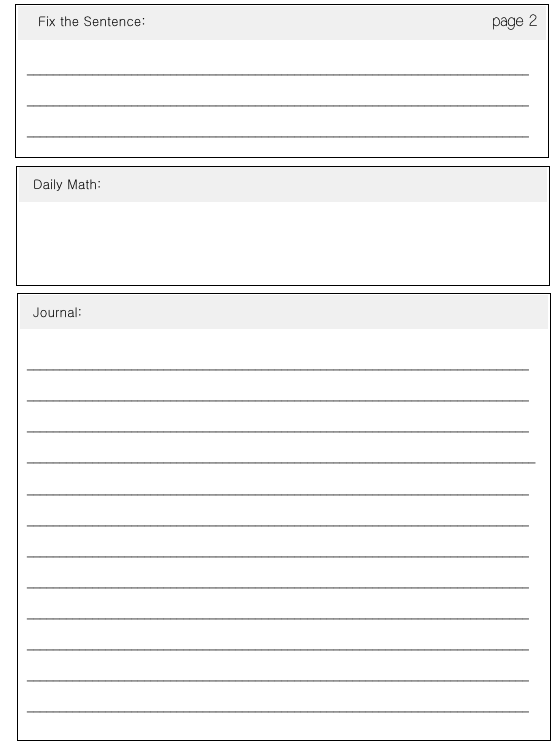 The daily journals are a great way for students to build their writing stamina, as well as share a bit about themselves a little at a time. I love the idea keeping these student work sheets bound together so my kiddos can keep track of their ideas and stories, as well as building their language and math skills. I always start the year off as doing these with the whole group, to show my students my expectations. After no time at all, they are doing their morning work independently. You could also use this resource as guided practice, direct instruction, small group work, a warm up activity, a classroom center, or a station run by a paraprofessional. This Daily Morning Work resource is going to be an amazing addition to my classroom this year! This resource is also available for Kindergarten and First Grade. Check them all out at our Teachers Pay Teachers store!